These wooden tree stakes / ground stakes can be used for a memorial plaque on a backing board, or with an engraved wooden plaque. These are fixed from the back so no holes are necessary through the front of the plaque or backing board. Made from sapele, iroko or oak either oiled or coated with a black preservative. 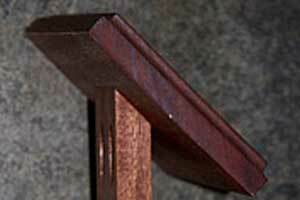 Iroko is similar to teak in appearance. It has a colour which can vary from pale golden brown to dark chocolate brown and medium to coarse texture with an interlocking grain that often produces interesting patterns. It is a medium density timber which is very stable, naturally oily and therefore highly durable and ideal for external signs. Oak is a hard, heavy and durable hard wood. Although generally having a coarse straight grain, it can have wonderful variations in grain, texture and colour and small pin knots and burrs are an attractive and acceptable part of its appearance. Although very durable it does need to be maintained - if water creeps in, fungal activity will cause the grain to blacken. Plaques and backing boards can be purchased separately. You can pay online with a card, by phone, by cheque, by BACS (online Banking) or Amazon.